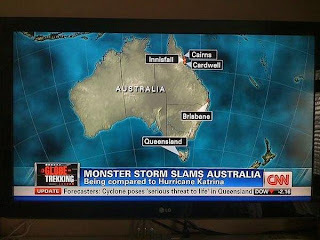 As Queensland reels from yet another natural disaster (Mother Nature must be extremely pissed off with us right now...) I couldn't help laughing when I saw this map of Australia courtesy of CNN. Erm ... Tropical Cyclone Yasi must have been more powerful than we thought if Queensland has been transported to Tasmania. And what's happened to the rest of our state? Seriously, my thoughts are with everyone affected by Yasi, which has been our most destructive cyclone yet. My week of giveaways will begin next week (fingers crossed), thanks to some lovely sponsors. And I hope the week may extend into two weeks or longer ... but I'll keep you posted. Giveaways are only for victims of Australia's recent natural disasters, or people who are entering on their behalf. 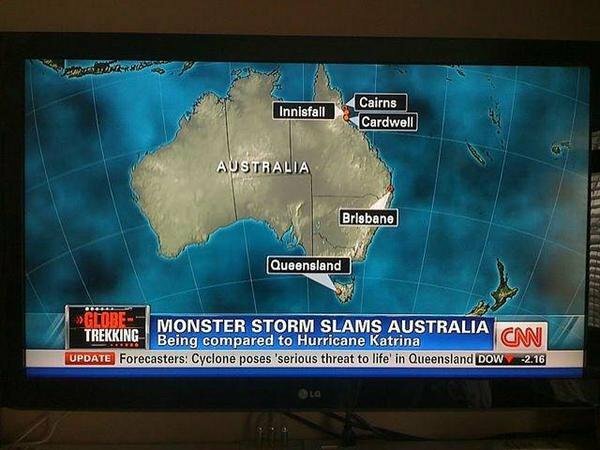 I can't believe CNN could make a mistake like that. Wow, you really can't believe everything you see on TV. Feeling for all the people affected by Yasi, it must have been incredibly scary. Thats hysterical. Let's hope someone has learnt their geography since then.